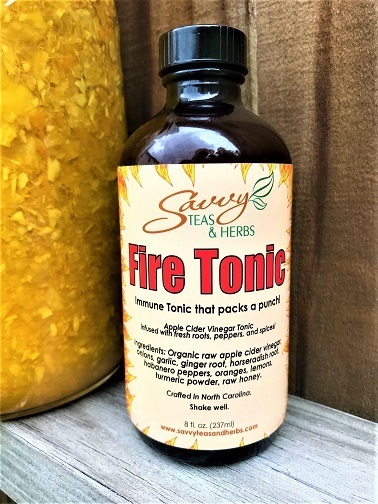 Fire Tonic is a folk remedy that has been used for many generations to strengthen immune health, ward off infections, improve digestion, circulation, relieve sinus congestion and much more. It restores, stimulates, and invigorates the body! Organic, raw apple cider vinegar is infused with powerful and spicy foods and herbs to create an immune tonic which packs a punch! It has a spicy taste with a hint of tart and sweet. A very strong flavor but very effective results!